It has been a very exciting past year or two for the fitness equipment industry. We have seen brand dominance being shattered to bits by the arrival of newer players in the market who are offering better prices for feature crammed machines. At the forefront among these brands is Universal, who is now considered by many as a flagship killer due to the rock bottom prices and unbeatable value. Today, we review their E40 elliptical trainer which is considered by many as one of the best machines aimed at the budget-minded shopper. There is a stigma associated with the phrase ‘Entry-level’ in the minds of potential customers and most people automatically connect it with tradeoffs. So, at EllipticalHub, we hate to label the Universal E40 as an entry-level offering from the Nautilus offshoot brand. Instead, we’d like to call it as a strong but barebones machine that will give you a workout as good as any higher priced and more hyped elliptical can. The upside is that you don’t blow a huge hole in your wallet either. Firstly, the E40 is shipped by FedEx in a large box that you will have to haul inside your house. The assembly can be a tad trickier than you expect it to. Having an extra pair of hands around will make the task that much easier. Also, ensure that you start the assembly in a large room with sufficient space and a hardwood floor. There will be oil leaks from some of the parts and it can stain your carpeted floor. Coming to the construction, the E40 is made from a durable stainless steel frame and stands approximately 64.5 inches tall and 56 inches in length. It weighs almost 90 pounds when fully assembled. Thankfully, there are caster wheels on the front which allow you to move it around the house if need be. It may not be the fanciest looking elliptical machine that you have seen. But it doesn’t look like a gimcrack either. In fact, it looks similar of the Schwinn A40, which is a beautifully designed elliptical machine. The machine has a 17-inch stride length and stays rock solid once you install it. There is no movement or wobble even when you are using it at the highest resistance. The control panel is minimalistic and is highlighted by the large LCD console which displays the information that you are tracking (time, pulse, RPM, pulse, speed, distance, heart rate, resistance level, course profile). The screen is organized, and the icons and numbers are easily visible. The only drawback is that there is no backlight. And in a really bright room, you may just find that some of the data is not clear. The E40 is designed to accommodate people up to 275 lbs. in weight and has an ergonomically designed frame with comfortable padded hand grips and a wide and soft foot rest. The hand grips have in-built pulse sensors that track your vitals. It also has a built-in speaker with an aux plug-in slot which lets you connect your audio devices. You can choose from 8 magnetic resistance levels and seven preset workout programs like Fun rides, mountains, and challenges. Toggling between the settings is easy even on-the-fly while you are using the machine. Other than the essentials, the E40 also offers a cup holder and a magazine rack. The most important part of the E40 is the fantastic full body workout it can provide. Even at the most basic setting, the machine allows you to hit your thighs, glutes, hamstrings, core, arms and shoulders. The elevated settings only make the exercise more grueling. There are no uphill or downhill settings, and the climber is flat in all settings. But that is not a major flaw as the difficulty levels more than makeup for the lack of this feature. The 17-inch stride and the build quality provide a smooth experience. Also, it is silent, which in itself is one of the reasons why it is so popular. Despite being a feature rich elliptical trainer, the E40 has a few inherent flaws, albeit minor ones. Here are some of the features which could have been better. Verdict: Priced under $400, the Universal E40 is a testimony to the fact that budget-priced does not necessarily translate into low quality. 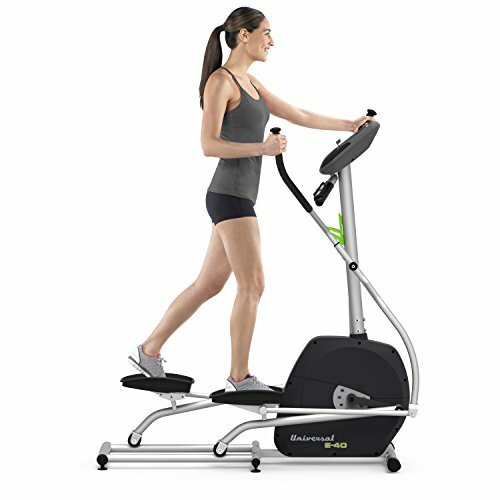 This is a very durable and good quality elliptical trainer for home use that can give you a vigorous, full body workout. E40 Elliptical Machine, Nautilus, Inc.